Hey Crafty Friends! I’m very happy to be joining everyone again for another 25 Days of Christmas Movies blog. Last year I did a mini album based on the Santa Clause 3 movie. 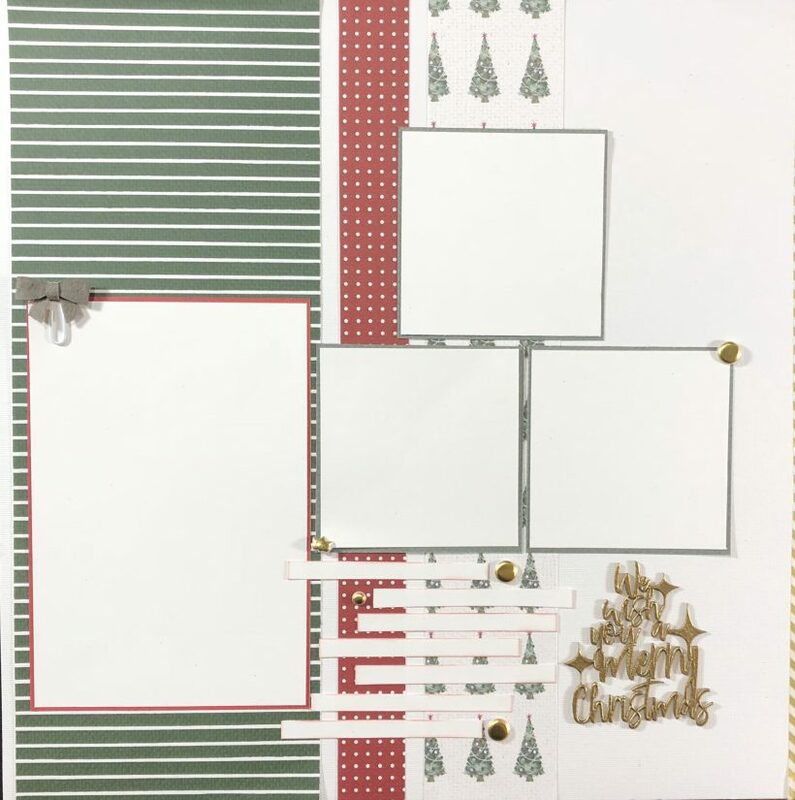 This year I created a Santa Clause Scrapbook Layout based on the first movie. My original intention with this layout was to use photos of our kids breakfast with Santa outing that our school does as a fundraiser every year. Unfortunately, this year it fell after the hop so I didn’t have any photos. What I did instead was created the layout and made white holding places for the photos. This is a great idea if you want to make something in advance or if you’re making an album for a gift. These photos are 4×6 and there 3×3. I love how there are lots of photos, but still white space on the layout. It doesn’t feel over crowded. I think my favorite parts about this layout are the little details. The journalling strips inked in red to match the red paper strip and the red photo mat. The chipboard title embossed in gold. For me it’s those little details that make a layout look cohesive. Thank you for joining me this year for my Santa Clause Scrapbook Layout. If you’d like to see the mini album I created last year inspired by the 3rd Santa Clause movie it can be found here. Don’t forget to meet the rest of the hosts for the hop to be inspired by food, drink and all kinds of holiday bits and bobs. Hey crafty friends! 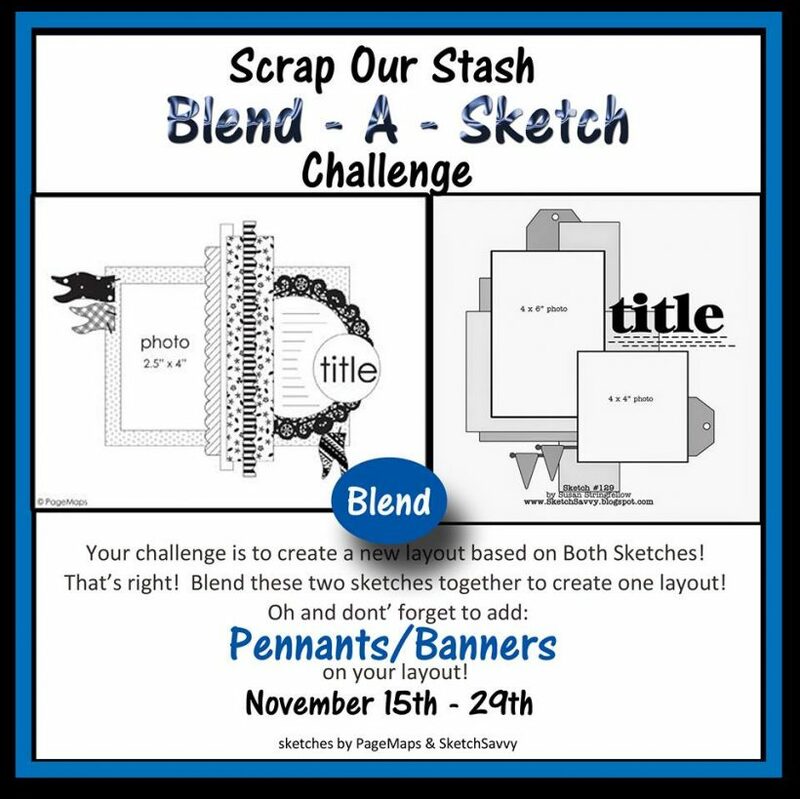 Welcome back to another Scrap Our Stash blend the sketch challenge reveal. If you’re new to this challenge we take two sketches and pull inspiration from both and then add a twist. This month our twist was adding banners or pennants. 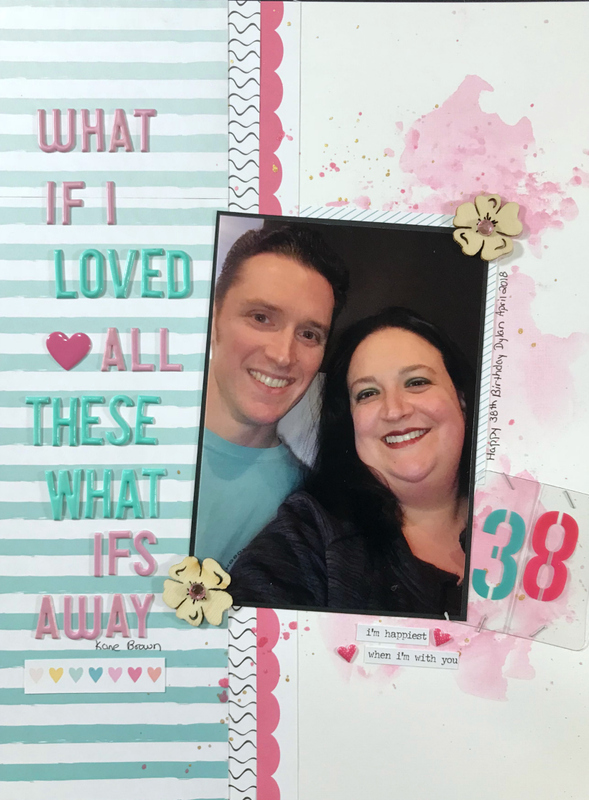 I completed this challenge with my family scrapbook layout. From the first sketch I used the doily as my inspiration for the large floral cluster coming from the upper left of my photo. I also used the strip idea from the first photo except I put them down the left side instead of right on the photo. From the second sketch I used the square photo shape and single word title. Also, from the second sketch instead of a tag coming from the right side I used a single banner and a floral cluster. If gave the same size feel, but I was able to use what came in the Felicity Jane kit I was using instead of adding other product. You can also see that some of my puffy stickers are pennant shaped to meet that part of the challenge. The photo is my brother and his beautiful family. My nephew is six in this photo and my niece was just six months. It’s hard to believe she turned one already! Hope you enjoy my take and can’t wait to see yours. As always, if you participate in the challenge or create a layout inspired by mine…please leave me a link down below so that I can come check it out! I love to see what others are creating. Until next time…stay crafty! Hey crafty friends! Welcome back for another Scrap Our Stash project reveal. 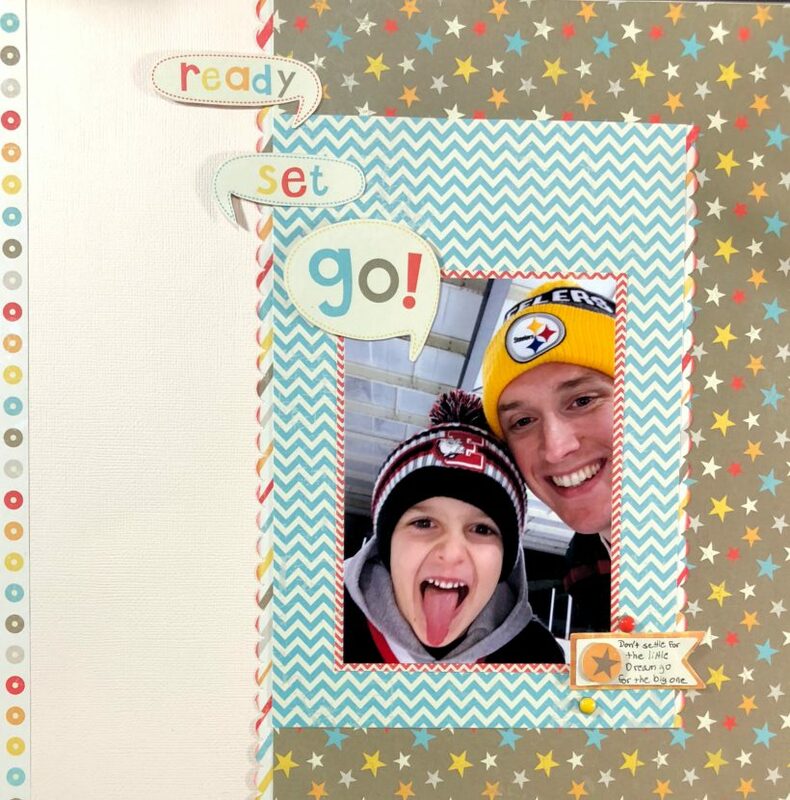 For this go around I created a father son simple scrapbook layout. I wanted to show that you can create a cute project is very little time without having to have a large stash or the latest products. If you’ve been following me on my scrap our stash team journey you won’t be surprised that I hadn’t seen/ didn’t know what the movie we were challenged with this month was. 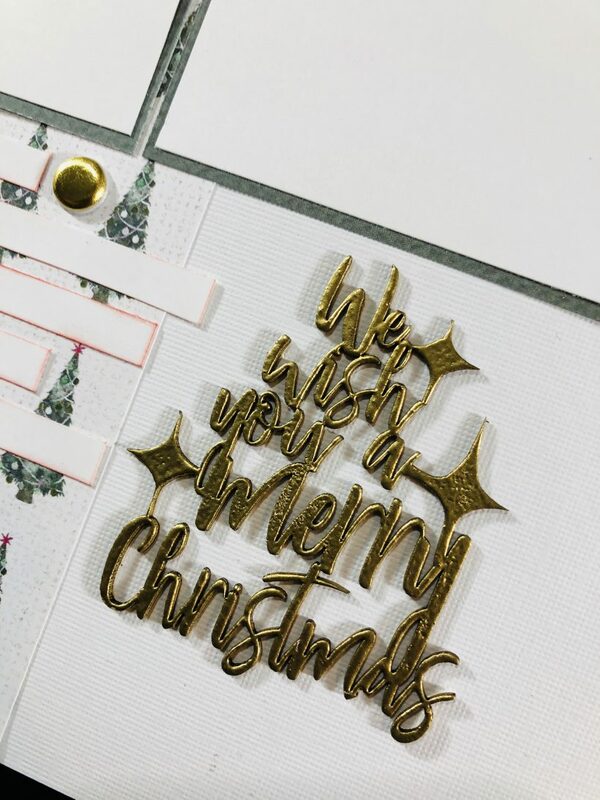 We were to use A Star Is Born as well as using star paper and/or embellishments, and a certain quote. For the quote portion of the challenge I wrote it on the little fish tail embellishment on the lower right hand side of the photo. This layout is so clean and simple I felt like it looked out of place anywhere else. I’ll actually do my journalling on the back of the page too to keep the simple look. I hope you have enjoyed my take on the challenge, and seeing how a simple layout can be lovely too. I’d love to see what you come up with based on this challenge, or even my layout. If you play along please be sure to leave me a link so that I can check it out too. Until next time….stay crafty! Hey crafty friends! I’m happy to be back today sharing another layout for Scrap our Stash. If you have followed my blog for a while, or their page, you know that the second challenge of the month is to combine two sketches, but with a twist. For this month I have chosen to create a boy scrapbook page. I’ll admit that I mashed these sketches so much that you probably can’t see either of them in this layout. I took the shape of the photo from the first sketch and the strip at the top of the page and used a strip on the top of my diagonal pattern. From the second sketch I used the fish tail banner turned sideways and the ink splatters. A bit about the photo – the young man on the left if our son Michael and the other two boys are two my girlfriend Katie’s seven boys. I have known Katie since I was born, and she was the matron of honor in my wedding. To make it even more special our son and Elliot (young man on the right) were born 11 days apart. Friends from birth…just like us! As another fun fact…The young man in the middle (Colson) and my nephew are almost the exact same age too. I’m really happy with how it came out, and how our son will have this page of his first friends forever. Can’t wait to see how you blend them together. Make sure to send me a link if you join the challenge! Until next time…stay crafty! Hey crafty friends! Glad to be back again so quickly. 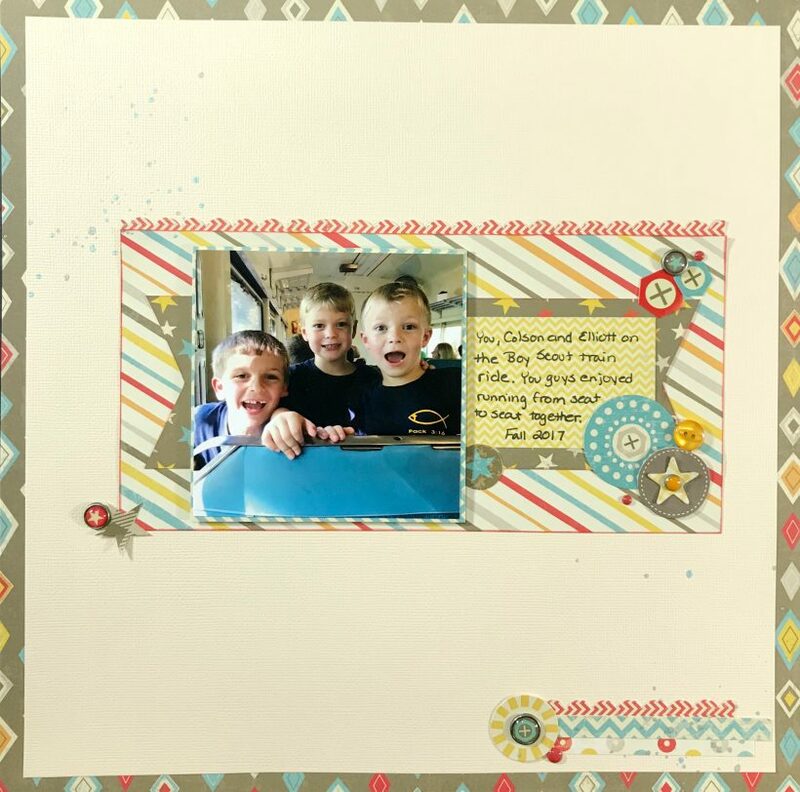 This time I have a long title scrapbook layout to share with you as part of the Scrap Our Stash Golden Group challenge for October. For this challenge we were asked to use the movie Sing as inspiration, and to add bling/whinestones to our layout. This was the first time I had actually seen the movie we were asked to use so that finally clicked, but I don’t have a big stash fo rhinestones so that was my challenge for this project. As my nod to sing I used a long title which is a lyric from a Kane Brown song. It’s appropriate for a picture of my hubby and I because I am a worry wart. I always have a what if for every situation. He is the opposite and always says what if…that doesn’t happen or what if it’s actually good. I’m so blessed to have that balancing force in my life. This kit is from Felicity Jane, and I will tell you it was gorgeous. If I remember correctly it was the Felicity or Alexis kit. The puffy stickers were my favorite piece. I paired the kit with some simple mixed media using the packaging technique. I did not use gesso prior to the mixed media and since I went light on the water there isn’t much warping thank goodness. I don’t remember where I got the wood flower, but they made a perfect home for a few rhinestones. I really love how this came out. The colors are some of my favorite to work with. How will you interpret the Sing challenge? Do you use long title? Make sure to tell me in the comment below. Until next time..stay crafty!